The All Progressives Congress (APC) has said that it would not allow the leadership of the Senate and House of Representatives of the 9th National Assembly to emerge through voting on the floor of the parliament. National Publicity Secretary of APC, Mallam Lanre Issa-Onilu, who dropped this hint yesterday, said as a party with majority in both chambers of the parliament, the names of the Senate President, Speaker of the House of Representatives and other principal officers would be read out on the floor of the chambers for adoption. Speaking at an interactive session with the media, the APC spokesperson confirmed the nomination of the Senate Leader, Dr. Ahmed Lawan as the candidate of the party for the Senate President position for the 9th Assembly. He, however, said his selection was not based on having better credentials than other contenders, but a product of wide consultations with party leaders. On the Speaker of the House of Representatives, the APC said it had not reached any decision on whom to sponsor for the position. According to Onilu, the party would take decision on it and other positions after settling the Senate Presidency issue. There have been speculations that the Majority Leader of the House, Hon. Femi Gbajabiamila had been tipped for the position. In the 8th Assembly, Gbajabiamila from Lagos (South-West) lost the Speakership of the House to Hon. Yakubu Dogora from Bauchi (North-East) before he was elevated to the position of Leader of the House. Onilu reiterated the position of the APC National Chairman, Comrade Adams Oshiomhole, that APC would not share positions with the opposition Peoples Democratic Party (PDP). He stated that the party would not expect the opposition party to partake in the choice of the Senate President and the Speaker. On why there should not be a contest on the principal offices of the 9th Assembly, Onilu said: “You must know that party discipline is correlated to party supremacy. So, when you begin to have interest other than the collective interest of the party that presents you for an election, then you are voluntarily excusing yourself from that fold of the party. “So, what we expect of any member who has interest in anything is to work within the party structures to ensure he achieves his interest. But he may not succeed if that interest is at variance with the worldview that this party shares. So, as we go to the next Senate, how it is done will be the way it will be done. You have principal officers and all of them are determined by simple majority and because Nigerians have given us more than enough, we have enough to elect all our officers. We don’t need a single vote from PDP. “In any case, we don’t envisage any election on that day because we are going to present our members to occupy these positions as the collective position of the party and all our members are experienced politicians who understand what this means. The PDP had already expressed its desire to have the leadership of the two chambers thrown open for contest among its members. The party has cited provisions of the constitution that run contrary to the views of the APC in the recruitment of leaders of the National Assembly. Section 50 of the 1999 Constitution (as amended) provides that there shall be:- (a) a President and a Deputy President of the Senate, who shall be elected by the members of that House from among themselves; and (b) a Speaker and a Deputy Speaker of the House of Representatives, who shall be elected by the members of that House from among themselves. When asked why APC did not zone the position and allow the APC Senators to decide on who becomes the Senate President, Onilu said: “That is also an option because there is nothing that says that has to be the only option. It is one of the several options. You also know that before you arrive on an individual, we must have considered what zone he comes from. So, the party, in its own judgement, believes that we will not only zone, but go as far as decide who, from that zone, is fit and proper as the Senate President. “You should know that from every zone of this country, we have ranking members in the National Assembly who are eminently qualified to be Senate President. But there is only one vacancy to be filled because we don’t have two Senate Presidents. In this case, considering other factors, the party took a decision. When I say the party, not just the NWC, because there was a wide consultation across the country, the party leaders, governors and the President and so on. 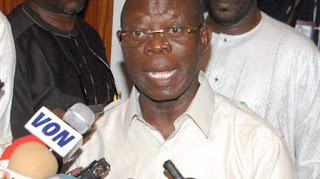 It is not just Adams Oshiomhole or the NWC. That is the position of the ruling party. Asked what would be the implications of what APC plans to do and if that would not be a threat to the democracy, he said: “APC will dominate positions. It was not a threat. That is democracy. I have listened to PDP react to this and, in their usual style, they exhibited crass ignorance. What we practice in Nigeria is the Presidential system of government and in a Presidential system of government, it is winner takes all. Once you win, you take whatever you want. There is no room for power sharing. You don’t need it because we don’t need them to run this government. We have enough members to run this government. “In any case, when we were campaigning, we never told Nigerians that we are going to share power with any other party. We told them to entrust power on us fully because in the last four years, we have made good use of power and we will make better use of it in the next four years. Nigerians graciously assented to that. It will be a betrayal of that trust to go ahead and start sharing power with a party, particularly the PDP that has been rejected by Nigerians.